Upon the recommendation of a friend and in preparation for holiday feasts I purchased yet another cookbook, (“Another one!” my husband would say), but this time it was more than just that. 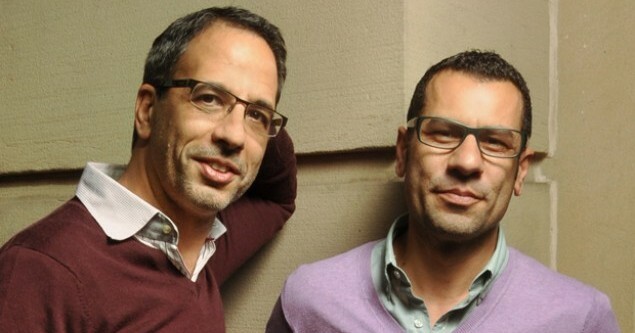 Released in October, the title of the book is Jerusalem: A Cookbook and it is jointly written by two chefs, Israeli-born Yotam Ottolenghi, and Palestinian chef, Sami Tamimi. What’s really special about this book is its conception. Two people who come from the same city – one from the predominantly Muslim East Jerusalem and the other from Jewish West Jerusalem – and grew up eating its unique local dishes, got together in London to explore their own “culinary DNA” and “unravel the sensations and the alphabet of the city” that made them “the food creatures” they are. The authors agree in the introduction of the book that they have obvious differences. “Food, however, seems to break down those boundaries on occasion. You can see people shop together in food markets, or eat in one another’s restaurants,” they point out. The authors also touch on the issue of hummus, whose origin is highly contested among Jews and Arabs, with each party claiming it as its own. In the book, both chefs see their hummus recipe as a unifying force rather than a dividing one. The book introduces the reader to the idea that although “Jerusalem food” is very diverse due to the different ethnicities that make up the city (Jews from all over the world, Christian and Muslim Palestinians, Greek Orthodox monks, to name a few), there are some typical culinary elements that can be found across the city. “Everybody, absolutely everybody, uses chopped cucumber and tomatoes to create an Arab salad, or an Israeli salad, depending on your point of view,” say the chefs in the book. At a time when Arab and Israeli efforts at putting their differences aside are not proving successful, this book has come as a breath of fresh air. With its stunning photography and 120 cross-cultural recipes ranging from fish to lamb and even dessert, the book struck a special chord with me mostly due to a discussion that took place at a recent Search for Common Ground workshop that I attended last month. The sad reality of the matter is that many Arabs and Palestinians in the diaspora subscribe to the notion of boycotting everything Israeli or Jewish including the people themselves. They believe this is one way of resisting the occupation and sending a message. However, I wonder if those who follow this logic might change their minds if they hear more from Palestinians who actually interact with Israelis on a daily basis. I also wonder if this book would make a tiny bit of difference if it was presented to them, demonstrating not only that Palestinians and Israelis can actually co-exist, but that they are also capable of producing this beautiful piece of culinary work. The first recipe I made from this book was turkey and zucchini burgers with green onions and cumin, topped with sour cream and sumac sauce. I can go on and on about how marvellous this recipe was with its fresh “Jerusalem” ingredients, but I would rather focus on the aftermath. My family was happy with the outcome and devoured every single piece of it, including my 14-month old son who is a very picky eater and enjoys throwing food on the floor. But what was special about this recipe was the conversation it triggered when it was presented to dinner guests. A healthy discussion about the Israeli Palestinian issue, co-existence and tolerance took place between my Brazilian friend Andrea and I immediately after her first bite of the turkey meatballs. Not only does this the book provide recipes for amazing, beautifully-presented food; it also opens the door for healthy debates. So if you are looking for a holiday recipe, look no further. Jerusalem, as always, is the answer! Sahtein wi afieh! Natasha Tynes is a Jordanian-American media professional based in Washington, DC.